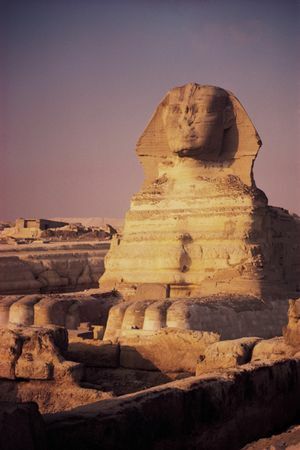 Egypt symbolises the mystical land of the Pharaohs, pyramids, mummies and the Sphinx. Float down the River Nile on a luxurious riverboat, relax on the serene shores of the Red Sea or Sinai coasts, tae a camel ride down the Sahara desert or just mingle in the bubbling cacophony of Cairo, this Egypt for you. It has been the earliest address of human civilisation and the bygone era is still experienced through the colossal and minor sculptures and ornamented temple columns and mural inscriptions. The intricacy and delicate nature of Egyptian art is displayed through the small statues made from alabaster, wood or ivory, artefacts made of glass, earthenware and jewelleries inlaid with precious stones. 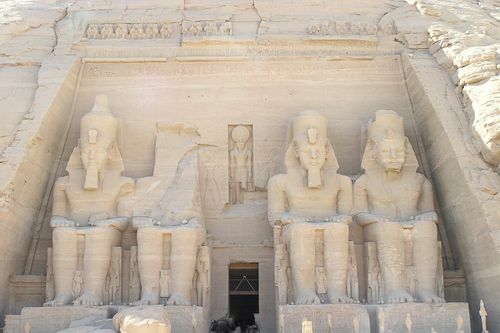 The unparalled proficiency of Egyptian art and architecture are clearly seen amidst the 97 pyramids along with the famous one of Giza, the Sphinx, the Labyrinth Temple or the “Maze Palace”, the Karnak, the city of Luxor and the and Abu Simbel. Ancient texts and scriptures like “The Pyramids Texts” and “The Book of the Dead” reveals their perspectives on theories of after life, secrets of the universe and various myths of gods, prayers and songs. The tomb of Tutankhamen is the most famous burial sight discovered till date with rich and luxurious funerary furniture. Situated on the right hand corner of northern Africa, Egypt is often identified with Middle East due to its shared topographical features and heavy Arab influence in social life. The country is bordered by the Mediterranean Sea in the north, Israel and Gaza Strip to the northeast, the Red Sea in the east, Sudan in the south and Libya in the west. It is spread over an area of approximately 1,020,000 sq km and is the most populous country in the Arab world with population of more than 77,500,000 people. The majority of the population settles by the bank of the river Nile and almost 90% of them adhere to Islam. Cairo is the capital and largest city of Egypt while other important destinations are Alexandria, Port Said, Suez, Luxor, Tanta, and Aswan. 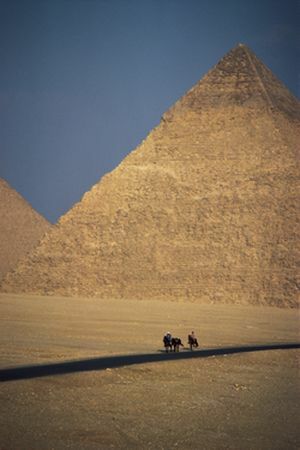 The geographical contrast of Egypt is the main reason behind the flourishing of its thousand years old civilisation. The fertile delta of the great River Nile supported agriculture and human inhabitation while the barren desert lands of east and west sides provided natural security borders against outside attacks. The topographical features of Egypt can be broadly categorised as the Nile Valley and Delta, the Western Desert or the Libyan Desert, the Eastern Desert or the Arabian Desert and the Sinai Peninsula. Nile is the second largest river in the world that flows down the central terrain of Egypt and ends its journey in the Mediterranean Sea. The three separate river flows of the White Nile. While the Blue Nile and the Atbarah come together to create the main Nile river, the Nile Delta is spread over approximately 22,000 sq km area and home to 99% of the population and agriculture activity. The Western Desert takes away nearly two-thirds of Egypt's land area and comprises of some highlands, badlands, salt marshes and salt lakes and some depression regions. The eastern deserts are as arid as their western counterparts but are more mountainous. This region is bereft of any oasis and human settlement but is a reservoir of natural resources like oil. The Sinai Peninsula is a jutted out land part on the northeastern part of Egypt. The northern half of this peninsula is flat and rolling plain whereas the southern part is full of mountain ranges. The coastal borders of Egypt are spread across around 2,900 km along the shores of the Mediterranean Sea, the Gulf of Suez, the Gulf of Aqaba and the Red Sea. Egypt is a trans-continental country due to its situation on the corner point of the African, Asian and European continent. Due to the existence of deserts in most of the area of the country, the climate is mainly hot and dry. However, the Mediterranean areas have milder weather and more rain. 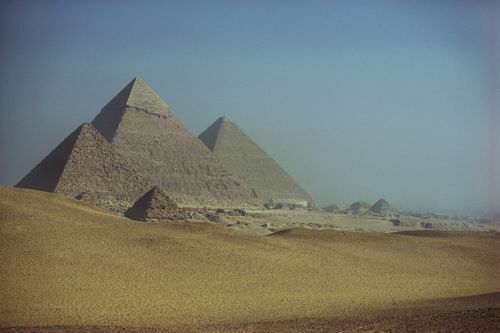 The history of Egypt forms a fundamental part of evolution process of human society and its cultures. 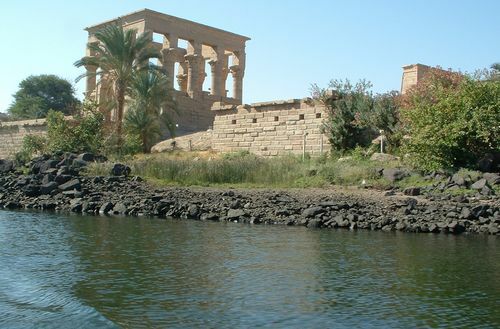 The deep-rooted ancient Egyptian civilisation revolved around the Nile and the fertile land along its banks. Arguably, the unified Egyptian state, established around 3300 BC, is the first central state of the world. It maintained external communication with rest of the world all along and was invaded by several races yet retained the Egyptian cultural peculiarity. Historians had a tough time chalking out a proper timeline for the journey of Egypt from past to present. 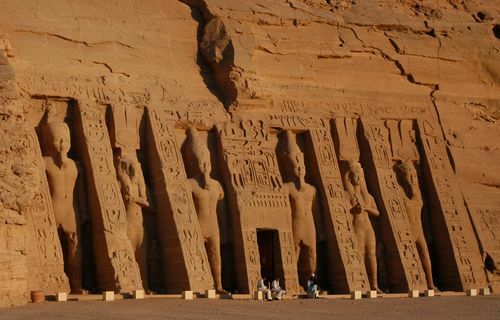 They started out with the Pharaonic Era, which was founded around circa 3200 BC by King Menes and lasted for 3000 years. These reigns of Pharaohs are often generalised into three broad categories of the Old Kingdom, the Middle Kingdom and the Modern Kingdom. All through these years, Egypt acquired fame all over the world in the fields of policy-making, war tactics, culture civilisation and religion. Egyptians made some outstanding achievements in architecture too, evident from the everlasting monuments like the pyramids and other temples. The Greek era arrived in Egypt with Alexander driving out the Persians who invaded the country in 341 BC. Ptolemy I, after Alexander’s death, became king and founded the Ptolemy Dynasty in which Queen Cleopatra was the last ruler. Roman rule swept Egypt in 30 BC and continued until 324 AD when it came under the Byzantine Empire. Christianity was introduced in Egypt around this time. Then the long reign of the Arabs starting from 641 came and left the everlasting impact of Islam over Egypt. The tribe of Mamluks took over the realms of the country around 1250 and continued until the Ottoman Turkish arrived in 1517. An invasion bid by Napoleon foiled the Turks and British jointly and Mohamed Ali Pasha became the founder of modern Egypt. The British occupation of Egypt commenced on 1882 following the construction of the popular and important Suez Canal in 1869. Despite ceremonial Turkish monarchy, Egypt remained a protectorate of Britain until 1922. Egypt became an independent sovereign state on February 28, 1922 but remained under royal rule. It proclaimed to be republic under the leadership of Gamal Abdel Nasser on 18 June 1953. The nationalisation of Suez Canal by Nasser in 1956 called for the infamous Suez Crisis and Israel, France and Britain invaded Egypt. From 1956 to 1961, Egypt and Syria united to form a single country called the United Arab Republic. Egypt and Israel led to the Six-Day War in 1967 and the former lost gaza ans Sinai to Israel. Anwar el-Sadat succeeded Nasser as president and was assassinated in 1981. Sinai was returned to Egypt in 1982. Hosni Mubarak became the next president of Egypt. The economic framework of Egypt survived the backlash of terrorist attacks in last decade of twentieth century and managed to hold ground despite other socio-political odds. The faulty and non-aggressive policy making on part of the Egyptian government also acted as a deterrent. Moreover, most of the official funds were spared for the continuing warfare with countries like Israel. As a result, the growth rate of the nation lingered around 2%-3% till 2001-03. However things started to brighten up from the following years as the financial authorities took the path to liberalisation and undertook measures to encourage foreign direct investment. The agriculture sector also started to yield better results from the Aswan High Dam of 1971 and the resultant Lake Nasser. The Central Bank of Egypt introduced policies to improve the liquidity level of Egyptian currency and the subsidy structure was overhauled. The better effects of all these changes became evident from the budget deficit rate that rose to an estimated 8% of GDP in 2004 and a more promising growth rate. Massive infrastructure and development projects are now being worked on with the help from bulk U.S. foreign aid, though heavy debt burden is a nagging problem with Egypt. The country got the biggest internal financial boost from the healthy earnings of the tourism industry and upheavals of stock market. However, increasing rate of population against limited arable land and over-dependency on the water and fertile lands of Nile are some of the crippling actors of economy of Egypt. Cotton, rice, wheat, corn, sugarcane, sugar beets, onions and beans are the principal crops of the country. Egypt is also the largest importer of wheat from United States of America. The remittances from Egyptians staying in foreign countries also are a major source of foreign currency in the country. Available Crude oil and natural gas are the two strong sources. Egypt states itself as a democratic and socialist republic and operates under a multiparty system with semi-presidential political structure. It is governed under the constitution of 1971 that defines the division and limitation of powers among the executive, legislative and judiciary bodies. The president, who is nominated by parliament and approved by public referendum for a six-year term, heads the executive structure. He enjoys the authority to appoint the vice-president and prime minister of Egypt. The prime minister is the head of government and is usually the leader of the majority party or coalition in Egyptian parliament. He along with his cabinet ministers remains accountable to the bicameral parliament of Egypt, specifically the lower House. The parliament consists of the People's Assembly or Majlis al-Sha'b and the Advisory Council or Majlis al-Shura. Out of the 454 members of the People's Assembly, 444 of them are elected by popular vote and the president appoints the rest 10 members. All of them serve five years in office. The Advisory Council comprises of 264 seats, of which, 176 are elected through universal suffrage and 88 are appointed by the president. The Council members serve six-year terms in the parliament. The Supreme Constitutional Court heads the judiciary section of Egypt and religious laws play a vital role in legal matters of the country. Constitutionally, Egypt is a unitary state with no subdivisions but foe administrative convenience it is divided into several governorates, cities and counties.